There are so many wonderful places just outside of Seoul that are perfect for a short weekend trip. But if you're traveling by car it can become a logistical nightmare on many levels- mainly due to the weekend traffic. 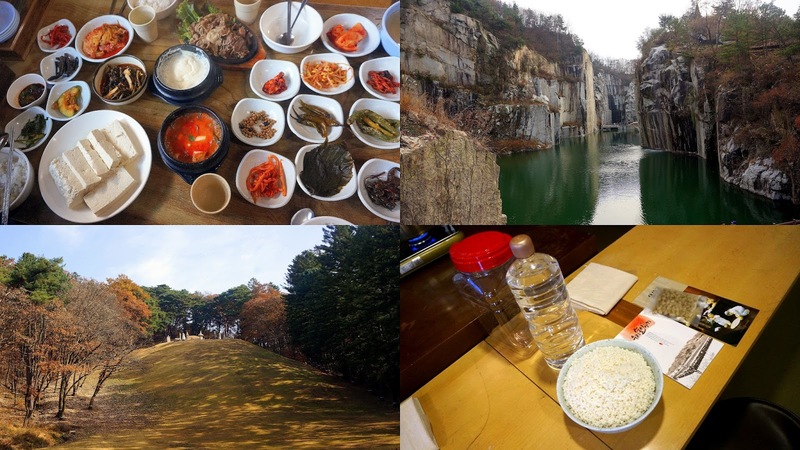 When a big group of friends had finally managed to coordinate our respective schedule together from Seoul for a short weekend trip we had looked in all directions on where to go and decided to try northwards to Pocheon. Pocheon lies in the northern part of Gyeonggido Province, the province that surrounds Seoul like the egg whites to the yolk. And while most of Gyeonggi Province- whether Incheon in the west, Suwon in the south, Yangpyeong in the east- are popular year-round as quick getaways, Pocheon and its adjacent cities in the north are comparatively less popular for weekend trips. We left Seoul on a Saturday morning and, except for some minor traffic within the city, there was virtually no traffic heading north. Normally heading any other direction from Seoul on a Saturday morning will mean inevitable delays but this was zooming. It may actually be even faster now because a new highway opened up a few months ago between the cities of Guri (just east of Seoul) and Pocheon. Our original intention was to begin the day by exploring the Korea National Arboretum as it was just heading into fall. Unfortunately we didn't realize until we arrived there that the Korea National Arboretum required advanced reservations through its website to enter. Bummer. What's truly mind boggling about it is that even now the reservation page is only in Korean. You'd think something as important as the National Arboretum would have multiple language options if they're implementing a reservation system but what a sad mistake on their parts. Our group scanned for something nearby and found the Gwangneung Royal Tomb wasn't far off and headed there. There's a short walk from the parking lot of the tomb grounds to the actual tombs which is quite peaceful and pleasant. As autumn was just beginning to show its form, it was quite a sight to take in. Apparently this forest is known to be the home of woodpeckers so maybe you'll be lucky enough to see (or hear) one on your visit. You eventually reach a pavilion from which the two tombs are found on your left and right with King Sejo on the left hill and the Queen on the right hill. Of course, it's forbidden to climb these hills. The pavilion itself is small but perched atop some old looking stones. It's very quiet here except for the occasional breeze or bird caw. Great to take in some fresh air. Admission price is 1,000 won for each adult, 500 won for children ages 7-18 years old. Groups of 10 or more can qualify for a discounted price of 800 won per person. Ready for lunch, we settled on seeking out a little place that was known for their ample side dishes and fare. The name of this restaurant is quite humorous in that it literally means "foul-mouthed grandmother's house". While in English such a name doesn't exactly bring about a warm and inviting sentiment, in Korea these "yokjaengee halmunis", or profanity prone grandmothers at many long-running restaurants and eateries, are known to be gruff and prickly on the outside but warm and endearing on the inside types. They've been through colonial occupation, warfare, governmental coups and all sorts of ish so they don't have the time or patience for your BS but, damn it, they'll make sure you're well fed before you're on your way. I guess the closest comparison I can make is like the grandpa guy from the Pixar movie "Up" who seems so grumpy on the outside but has a soft spot. In this famous restaurant in Pocheon, the grandmother is apparently well known and even appears on the restaurant sign by the road. The restaurant is located inside an old traditional Korean home with the entrance taking you inside the main central courtyard. Everything here is made by hand and so famed is the grandmother's decades of culinary know-how that her jangs- such as soybean paste and soy sauce- and many side dishes are on display for sale. And let me tell you, not even the most premium jangs at a grocery market can hold a candle to these basically artisan variety. The regular jeongshik or "set" is at 7K a person but what many do is order a few other main dishes to split. You can order a plate of their traditionally stone mill ground homemade tofu, their charcoal grilled bulgogi (non-marinated), their potato bindaetteok, etc for about 6-8K a plate. And if you take a look at each side dish, you can tell everything- down to the seasoning and sauces- are made in-house. So fresh, so clean, so good. The steamed homemade tofu comes steaming hot, its nutty smell just beginning to tickle your nose. Soft to the bite but with just enough density to give it some sturdiness, it was the perfect blank canvas to the ripened homemade kimchi which was at that level where it was fermented just enough without the whole cabbage beginning to break down. They also offer a big bowl of rice to scoop to your own plate as much to your heart's content. Perfectly fluffy and steaming, careful not to overdo yourself with them though as there's so much to eat on the table. The bulgogi is also coked to order so comes hot from its grilling. It's not marinated but it is cooked over a wood fire to give it a nice smokiness. While it's not exactly top of the line cut of meat, it's perfectly fine for ssam wraps and definitely not easy to find such wood-grilled bulgogi in the city. The foul mouthed grandmother whom the restaurant is named after was not there on my visit but her presence was quite prevalent in some wonderful, personality-rich photos that was around the entire restaurant grounds. On the way out, there's some home brewed tea made of sweet wormwood and Jerusalem artichoke which was said to be healthy and had that bitterness taste that can only be classified as healthy. I managed to down my cup but my friends were unable to finish it! I mentioned Pocheon's clean waters gave rise to their famed home brews, such as makgeolli. What better place, therefore we reasoned, to take a class on how to make traditional Korean liquor? Sansawon is a traditional Korean liquor museum and garden that really is a must for those who enjoy touring breweries and also getting a bit of local history and culture mixed in. It showcases the history and various regional traditions of Korean alcohol, has a wonderful and unlimited (!) liquor tasting section with an extensive range of traditional drinks, offers alcohol classes, and has a sprawling outdoors area that is nice to walk around. The museum section offers a look at the history of traditional Korean alcohol (Korean traditional liquor has more than 2,000 years of history), its traditional methods of brewing, and has plenty of artifacts and exhibits. I was fascinated at taking a look at all the various traditional liquor by regions of the Korean peninsula. Some, like Andong Soju, I recognized but most were completely unknown to me. Before the Japanese colonial period, most families made their own traditional spirits but with the occupation liquor-making was regulated and limited extensively by the Japanese government which then, after the Korean War, was regulated further by the Korean government and even dramatically changed the making process. For example, a severe restriction on rice usage (which was the key component of making traditional liquor) in the 70s, made way for substitutions with things like potato, and later chemicals, which gave rise to the cheap, mass-made green bottles of soju that is so common today. But the real home brews that were usually made and found in most households were the real unfiltered stuff. After touring the museum side, head downstairs and pay a more-than-reasonable 2,000 KRW (approximately 2 USD) entry fee and you enter the huge tasting area where you can sample an enormous range of brews by Baesangmyeon Brewery. The variety is really quite jaw-dropping and divided into section/categories such as makgeolli, yakju, fruit-based alcohol, etc. Now I mentioned there was a 2,000 KRW fee per person but this fee is just unbelievably low. First, you're given a new shot glass from the brewery which you not only use to sample the variety of drinks but you get to keep at the end. Second, not only is there a wide selection of drinks to sample from but it's unlimited! In between the stations there are little spots where you can wash out your shot glass but go around and try everything once and then try again some of your favorite drinks! You definitely could see quite a few folks with red cheeks walking about. There's also a station for some very simple anju nibbles and a section where you can purchase some of the favorite drinks you've had- a perfect gift for loved ones. Boozed Fueled up with some happy water, we moved onto our pre-reserved class ready to make our own brew. There's also the fruit liquor alcohol class where you make your own brew using seasonal local fruit and the seasonal specialty drink making class which are 45,000 KRW and 30,000 KRW respectively with both classes also being 2 hours. Whichever class you take it includes instructions from a professional, all material and equipment, and also allows you to take your home brew with you! The spacious classroom is in a private kitchen lab and will have all your individual equipment and ingredients neatly set up for you to begin. After a short presentation by the instructor on the history and method of Korean liquor, you're ready to get started on your own. We opted for the traditional Korean liquor making class. The rice came pre-soaked to cut down on time (usually this step requires the rice to be soaked overnight). The rice is then gently steamed in cheesecloth over low heat to make cooked rice that's also dry (not sticky). After cooking, the rice is carefully spread out to allow it to cool and dry significantly which takes about 20 minutes or so. At this point, you're given some free time to wander around to which you can go down to sample the alcohol if you haven't done so already or wander the grounds which we opted to do since we had already downed our share of drinks. We came back to our nice fluffed, cooked rice. To the clean, sterilized jar, the rice and purified water is added. Then nuruk, a traditional Korean yeast used for making alcohol, is added by gently breaking it in. ...Not yet the final product because at this point you need to let time and nature do its course as it ferments but usually a week will do. They provide pens to write your name and date on your big jars which you now can take home with you. While our rice was cooling, we explored the gardens. First is the Saewallang where row after row of these enormous traditional pots sit. These aren't for decoration with each holding liquor that are fermenting inside. Did I mention they are huge? Each can contain up to 650 L of liquid. Here are some hoooomans standing for some comparison. You can also write a wish to tie up on these wishing jars. They also have on display all these early 20th century era equipment used for liquor making. Very fascinating. A small rice storage brought over from Bu-ahn demonstrates how the traditional nuruk (see above) was dried and stored. These yeast "discs" are a key component of Korean liquor making! A beautiful traditional structure called Woogokrue is on the grounds. I heard the first floor operates as a cafe but it was closed on my visit. Another top attraction of Pocheon is the Sanjeonghosu or Sanjeok Lake. It's actually a man made reservoir that was built in the 1920s when this valley was flooded to help supply water for the surrounding farmlands. But the surrounding mountains, nature, and aquatic activities has now made it a popular attraction year round. There's a walking course that takes you around the lake which I heard takes about 2 hours to complete. So yes, it's quite a nice scenic walk. Despite its natural beauty, there's a small amusement park in one section which was blaring music from the rides which was a bit of a disappointment. I understand you're trying to make tourism money but man, how jarring it is to hear K-Pop at obnoxious noise levels over these placid waters. There are a few restaurants, cafes, etc scattered around for some rest and fueling. I didn't check any of them out but they seemed quite popular and some of them quite pretty. In terms of food, Pocheon is probably most famed for their Pocheon galbi. These ribs are usually marinated and charcoal grilled which became popular first for their (at the time) large serving sizes and low prices that catered to the many Korean soldiers serving in and around the DMZ not too far off from Pocheon. Many years since then prices have gone up significantly at these restaurants. But one way you can save some money is by stopping at a place that sells the ribs prepackaged. So long as you're staying nearby at a place where you can cook them, you can try these ribs out for a lower price. The place we went to offered packaged marinated ribs in beef or pork which costed about 27K for a 2 person beef rib package and 16K for a 3 person pork rib set- still excellent prices compared to barbecue in the city. They also offer things like seasoning, grilling equipment, sides, etc for sale at the shop too. Our rented cabin had space for barbecuing so opening these babies up, we got to work being careful not to lose their marinade. Quite sweet but very tender. This will be a hit for the whole fam. While you're stopping by the market here, don't forget to pickup a bottle of the Pocheon makgeolli which, I mentioned, is also well known. Supposedly better than other regional makgeolli because of the area's clean waters, I can't really tell but hey, as long as it's not too sweet, I'm not too critical about makgeolli in general. On our second and final day, we began by stopping by arguably Pocheon's most famous attraction- the Pocheon Art Valley. This was actually a former mining quarry that was abandoned before the city then deciding to restore it as an environmental/cultural park of sorts. It worked out for the city as it is now one of the city's most visited sites. You can generally tell by the size of an attraction's parking space on how large the attraction itself is and Pocheon Art Valley's parking space is enormous and extends out quite a bit and over various levels. 2. Paying and taking the monorail. Walking is free and the path is paved but it is an ascent climb to the top so for the physically impaired or elderly, the monorail is a better choice. The monorail itself is a slow and scenic ride and costs 4.5K, 3.5K and 2.5K for adults, youth, children respectively for individual roundtrip tickets while the same for a one way fare is 3.5, 2.5 and 1.8. This is the convenient option and we took this option going up thinking we'd save on time but we didn't know that the monorail is a single car which means you have to wait in line to not only board at either point but wait quite a few minutes as the slow, singular vehicle makes its way up and down. The monorail price is also separate from the admission fee which is an additional 5K for adults, 3K for youths, and 1.5K for children. Like many similar attractions in Korea, there's an assortment of things to do and see at the top. There's a decent sized astronomy museum for kids that's free except I think most of the explanation signs were in Korean. There are also many walking trails that takes you around the grounds with random statue art installations around. The biggest attraction within the Pocheon Art Valley itself is probably Cheonjuho or Cheonju Lake. It's actually a man-made lake that formed after a 20m deep mining hole gradually filled with water. As the quarry grounds is now no longer used, it's actually become home to a variety of animals who live in and near this lake. The lake itself certainly gives off a different impression from other lakes not only by its deep emerald hues but also the surrounding cliffs that were clearly cut and drilled through by miners long ago. The trails lead you from atop, looking down on the lake, down to the lake level itself giving you plenty of different angles to view this interesting lake. Part of getting down also takes you through these winding stairs. We were lucky to have followed the trail that took us down instead of up these stairs. You could literally see the poor folks who had come the opposite way look up at the stairs and their faces fill with a sense of dread. Cliffs are quite massive, really. All in all, a hodgepodge of things to do and see. I'm not sure if there's really an overall connecting theme to all of it but the variety is wide enough there should be something to appeal everyone. We made a pit stop to Bidulginangpokpo or Bidulginang Waterfall. The waters starts up on Bulmusan Mountain and eventually cascades down this small but pretty waterfall to join the Hantan River. It's located right next to major camping site and is easily accessible making it a popular filming spot for various Korean dramas and movies. Make a short trek down a reasonable flight of stairs and the waterfall is right in front of you. Bidulginang actually means "pigeon pouch" or pigeon roosts because apparently there used to be huge flocks of wild pigeons that roosted in the little spaces under the cliffs. I'm not sure if that's still the case today but we didn't run into any of them. Though the waterfall naturally isn't very big, it's obviously less so as you get to winter time when its starting rivers are frozen. Still, the pretty blue hues from the pool below was quite beautiful. As were the surrounding landscape. Before making our return to Seoul, we capped off our Pocheon visit with a final lunch. A place called Onggigol Manchan caught our eye as its ssambap (lettuce wrap sets) with freshwater snails (ooreong or 우렁) was said to be a favorite with the locals as well. Their various sets are also more than reasonable for the variety and quantity of food that's included. Their basic ssambap set is priced at 10K a person and included the ooreong, ooregon ssamjang, spicy pork, assortment of leaves and greens for wrapping, soondubu, and bibimbap. The "special" version of that set is only 12K a person and includes the same offerings with the addition of ddeokgalbi. For smaller appetites you can opt for the ooreong ssambap (which doesn't include the spicy pork), the spicy pork ssam bap (which doesn't include ooreong) or the ddeokgalbi (which doesn't include the spicy pork) which are all 9K. All of these sets also require a minimum order of 2 servings. You can also opt for just simple seafood soondubu, ooreong dwenjang jjigae, wild sesame soondubu, etc at 6K. They make it a point to share that their ooreong and rice are all Korean-based. We all opted for the basic ssambap set. Interestingly for those who order their ssambap set, they offer a glass of their dongdongju for free. As we were a large group, they gave us a large bowlful of it to serve ourselves. I'm never one to turn down rice wine and if it's free, even better. I noticed they also had a sign that said for currently serving soldiers and groups larger than 8 pax, free beverage (Coke or Sprite) were offered. Soon they brought out a wide assortment of side dishes. Mostly root-based sides, I enjoyed how each main ingredient was prepared accordingly with different cooking methods and seasoning to best bring out their flavor and texture. The plate of greens for ssam is also a nice variety. The plain soondubu is silky smooth with a nice creamy flavor. Add just a drizzle of the seasoning to your bowl and let the warmth and mellow goodness warm you up inside. Soon the bubbling pot of ooreong dwenjang jjigae as well as their homemade ssamjang with ooreong is brought out. The ooreong ssamjang comes piled with plenty of plump ooreong. I suppose for those who haven't tried it the term "snail" alone may be off putting but really the texture is similar to abalone and just a nice chew. Scoop some of the ooreong with the earthy and savory ssamjang onto a bed of leaves and greens, add some rice if you want, and wrap it up for a big bite. Good stuff. The bibimbap is not like a full on bibimbap but essentially you're given your own bowl with some toasted seaweed strips and a drizzle of sesame oil. Add rice, the ooreong ssamjang, and whatever sides you want and give it a mix altogether. Still too dry? Add a few more spoons of the dwenjang jjigae. A nice, non-overbearing meal to cap off our short trip. In case any of you were curious on how the homemade gayangju turned out, here it was a few days after being made. You can see it fizzle and bubble as it ferments. A week later from making, you get the rice and yeast settled while the alcohol atop it. You can strain out the rice to leave you the clear liquid (dongdongju) or you can actually strain out the rice mixture, blend it, and add it back in for milky makgeolli. A nice reminder of our time in the merit-filled city of Pocheon.